Abilities are all of the moves and attacks which slightly defy logic on the site. Abilities push the boundaries of what normal people can do by using Stamina or Magoi. Abilities are sometimes classified at ‘techniques’ or ‘spells.Besides the name, there is literally nothing different between techniques and spells. A person's stamina and magoi levels come from the same pool and all abilities take up points from the one total. Similar to your overall character and your specialization, abilities have five tiers. Higher-Tiered abilities are more powerful but also cost more magoi/stamina. *Special note: a tutorial on what should be in the individual ability fields can be found at this tutorial if you click here. Characters may begin with up to 5 registered abilities they do not have to train. You may begin with 1 C-Tier and 4 D-Tier abilities. These abilities must still go through the approval process, which begins by posting them here. Eventually, you will need more abilities than those 5 which you started with. This is where we introduce the training system! First, you must post your new abilities to be reviewed for approval here. This is to make sure that your abilities follow all guidelines. *Note: A player may only set up 5 abilities to be approved for training, per topic. Once your new abilities have been approved for training, the topic will be moved to the 'Approved For Training' section, which can be found here. At this point, you may train the approved abilities. You can train abilities in any topic as long as it isn't part of an open plot event. 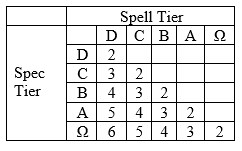 To train a spell to a certain tier, all you do is type up a certain amount of words, detailing your training session and the way you learned the spell. Training an ability has a different standard than training a specialization. The word-count can be met through a variety of means, including the process of developing character plot. Not every part of the word-count needs to be directly related to the ability itself. At the same time, it is more than acceptable to write only about the ability itself in order to meet the word-count for the ability training. Everything from training the muscle memory of your body, down to the movements and agility needed to perform those movements. This splits a post into multiple parts. Any ability trained in a post must be used in one of the posts that are used for that same training (Ex. : training 1 ability over the course of 4 posts, 1 of those 4 posts should have the ability in it), and should be in bold lettering so that those who are grading it can see when and where the ability was used. Once you have finished training an ability, you will need to post a link to the post that you began the training in. This link should be posted within the topic you had your ability approved at, which had been moved to the 'Approved For Training' section. Once all abilities in that topic have been trained, it will be moved to the 'Trained Abilities' section of the forum found here. At this point, you may add the approved ability to your vault so future use. Sometimes, you'll notice that some of your abilities are lacking in terms of "oomph". Perhaps you want to make them more powerful or replace them completely. Well, you can do just that through "Re-Training". Re-Training abilities is practically the same concept as training them. The word-counts are the exact same, and you can train them in the same types of topics too. In Training Topics you never run out of Magoi/Stamina. These topics can under no circumstances be kill viable. These are the only topic types you may train your Specialization in. *You may only use abilities 1 Tier above your own, up to A-Tier. You must be Omega-Tier to use Omega-Tier abilities. You may only use an ability ONE time per post, even if it is sustained. Your specializations must also be of the proper tier if you want to use higher-ranked abilities. Ex. : A C-Tiered Warrior with his Strength Spec at C-Tier can only use B-Tier and below Strength abilities. The following rules detail all of the "specifics" of abilities, including damage, effects, and more. D-Tier: These abilities cause bruises and minor trauma upon impact. Cuts barely go past the skin and just start to touch tissue and muscle. C-Tier: These abilities cause major bruises and can easily knock opponents back upon impact. If hit with one directly a person can suffer from fractured bones. Cuts can cut about halfway through muscle. B-Tier: These abilities can break bones upon impact, and can possibly cause major internal damage. Cuts tear straight through muscle and are able to cut halfway into bone. A-Tier: These abilities are capable of crushing whole limbs and bones. Cuts can amputate a limb, and the damage of these abilities can be considered lethal depending on what part of a target’s body is hit. Ω-Tier: These abilities are often instant-kill moves. They are capable of destroying entire bodies in one blow. The body can be completely bisected by cuts, or crushed and flattened under force. Each higher tier is 2 times stronger than the previous tier. This means that two attacks of a single tier will deal damage equivalent to a tier higher and vice versa. Ex. : If 2 D-Tier attacks hit, the resulting damage is of C-Tier strength. There are limitations on the amount of A and Ω-Tiered abilities you can have, which can be found in the Rank System topic. Equal Tier Vs Equal Tier: The abilities cancel each other out and dissipate. 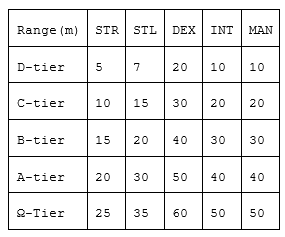 Tier Vs Tier Lower By 1: The higher-tiered ability automatically destroys the weaker one and goes through, however the damage it deals will be halved. Ex. : B-Tier ability collides with C-Tier. B-Tier passes C-Tier and makes it dissipate, however the B-Tier only deals C-Tier damage due to it being weakened. 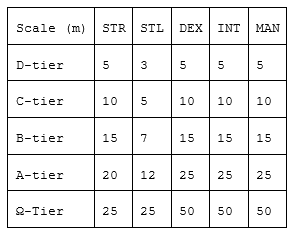 Tier Vs Tier Lower By 2 Or More: The higher-tiered ability goes straight through the lower-tiered one and deals full damage if it makes contact. *Side note: A D-Tier ability is considered 2 ranks higher than a Basic Attack made outside of an ability. Any ability that clashes against a non-ability attack automatically wins out in the clash and the ability deals full damage to whatever it clashed against, be it a weapon or a body part. Sustained Abilities are those that are kept going for consecutive posts. On the initial use of a sustained ability, you pay the full cost, and for every proceeding post you pay half of the cost. Ex. : An A-Tier ability would require 40 Magoi/Stamina on the first post, and 20 for every consecutive post it was kept active. Sustaining an ability allows you to do one of two things. 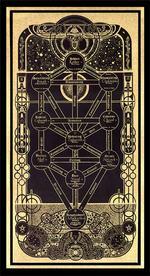 You may either create an entirely new ‘instance’ of the spell, or you may continue controlling a previous ability. You may only use an ability one time per post. That last thing to keep in mind about sustained abilities are their cool-down amounts. Cool-downs begin once the ability is completely released, not on the initial usage. Cool-Downs are the amount of posts you have to wait before you can use a given ability again. They must be at least one post longer than the duration of your ability. Now some people might be confused as to how cool-downs actually work. After a given duration is up, then each FOLLOWING post counts as a cool-down post. You can use an ability again ON the last cool-down post. Finally, cool-down posts only count as YOUR posts, and not the total amount of posts between every person in the topic. Ex. : An A-Tier ability is used and the duration ends. You post 7 more times and use the ability again on the 7th post. Offensive: These abilities deal damage and are the ones which typically follow all of the guidelines above. Defensive: These abilities are used to block/parry/deflect others. Supplementary: These abilities do not deal actual damage, but instead have other uses, such as ‘Status Effects’. This class also pertains to stat buffs and concepts such as flight, healing, and invisibility. Social: There abilities are used strictly in a social setting for a multitude of reasons. It is possible to have abilities that are a combination of classes. The combinations allowed are; Offensive/Supplementary, Defensive/Supplementary and Supplementary/Supplementary. There is one hybrid class that is not allowed. Offensive/Defensive abilities are forbidden. This is to prevent people from making abilities that automatically counter opponents. You may still counter an opponent by following a defensive ability with an offensive one in a single post. For combinations of Offensive/Supplementary/Defense, you will be docked one tiers worth from both effects. This means at D-tier, you would be unable to combine abilities in this fashion. If you wish to have a C-tier Offensive/Supplementary ability, the damage and the status effect would both have D-tier effects. If you wish to have the full power of the status effect, you must use a purely Supplementary spell. When posting an ability to be graded, you must ensure that there are 5 things in that description. The speed at which the ability is performed, the damage that it does (if any), the method it uses to do damage/visual effect of the ability, and the dimensions of the ability and the overall effective range of the ability. These guidelines cover the maximum amounts for each of these things, per ability, per specialization. Along with your normal abilities intended for combat, you also have 15 slots of “social” abilities. These abilities will cost no magoi or stamina to execute. These abilities cannot be used for combat in any way, shape or form. (This includes being used as distractions, blocking mechanisms or in any other fashion.) These are simply intended to give you a wider range of social capabilities. These abilities will follow the normal guidelines for their specialization and but will not need to be approved. However, these abilities will not require training. These are simply abilities intended to enhance your role-playing experience. This means you may make these up ‘on the fly’ as long as they abide by normal ability guidelines. Defenses are abilities which pertain to blocking and/or parrying other techniques. These abilities are capable of protecting against two attacks equal to them in tier, and 1 attack a tier above. Attacks which are tiers below are simply treated as if they deal half the damage. Eg. A B-Tier defense can protect against 1 A-Tier, 2 B-Tier, 4 C-Tier, or 8 D-Tier abilities before breaking. When a defense breaks no damage is dealt right at that moment and the attacking spell dissipates regardless of rank. Healing is the art of encouraging recovery within a patient who has wounds. This is either through a slow healing process over the course of the topic or, at higher levels of proficiency, near instantaneous recovery. Support Beasts, Life Mages, Manipulators and those with items that give them access to Life magic (like some Djinn Equippers or some magic tool wielders) are capable of registering these abilities. D-Tier: Can heal D-Tier damage over 2 posts. C-Tier: Can heal C-Tier damage over 2 posts. B-Tier: Can heal B-Tier damage over 3 posts. A-Tier: Can heal A-Tier damage instantly. These abilities can also recreate limbs and certain organs. Ω-Tier: Can completely resurrect a character, regardless if they have run out of all three of their lives or not. A Resurrection can be used at any time, as long as the healer is in the same location as the deceased party was. *Note: Resurrection will not work every time. If, OOC, a player does not wish to be resurrected or if a Staff member says an NPC used by Staff cannot be resurrected, the spell fails on that occasion. Illusion magic is unique in that different specializations may detect it differently. While a non-intelligence specialization may never detect an illusion for being an illusion, magicians would be able to detect the manipulation of the rukh. Those with intelligence would be able to detect an illusion one tier below them, while those two tiers below them, they would be able to see through. The exception to this is any magician with experience in illusions, such as Light magicians. Those with experience with illusions would be able to detect one at the same tier of themselves and be able to see through an illusion one tier below them. Invisibility-based abilities can only be used by Tactician Beasts, Stealth users, and Magicians who can utilize Light Magic. Stealth users are capable of applying special gels to their bodies and weapons or rapidly altering their appearance, however these never exceed proper camouflage. Keep in mind these still abide by the sustain guidelines above. Status effects are supplementary effects used in an ability that may not deal damage, but implement a specific effect. Disorientation can be caused by various factors but will always double reaction time. Blinding is caused by an intense flash of light interrupting vision. This is often a result of Light Magic or fire. Stunning is generally a result of a blow to the head. D-Tier: Disoriented for 1 post. C-Tier: Disoriented for 2 posts. B-Tier: Disoriented for 3 posts. A-Tier: Disoriented for 4 posts. Ω-Tier: Disoriented for 5 posts. Bleeding is caused by a deep laceration and can continue to inflict damage if the damage is not repaired. Bleeding causes D-tier damage each post until the bleeding is stopped or the duration runs out. D-Tier: Bleed for 1 post. C-Tier: Bleed for 2 posts. B-Tier: Bleed for 3 posts. A-Tier: Bleed for 4 posts. Ω-Tier: Bleed for 5 posts. Burning effects are caused by instances of great friction or from fire-based spells. A powerful enough heat-based spell may cause actual flames, which will deal additional damage per post. This effect can be negated by putting out the flames (you may simply role-play patting them out or rolling on the ground). B-Tier: 2nd degree burns, actual flames constantly burn the body for 2 posts, dealing additional D-tier damage per post of actual flames. A-Tier: 3rd degree burns, actual flames constantly burn the body for 3 posts, dealing additional D-tier damage per post of actual flames. Ω-Tier: 4th degree burns and complete incineration; actual flames constantly burn the body for 4 posts, dealing additional D-tier damage per post of actual flames. Paralysis based abilities are caused by striking nerves or using lightning-based spells. Paralysis will reduce movement speed based on the tier. This status effect can be used by those with Stealth and Lightning Magicians. D-Tier: Paralysis can numb 1 limb for 2 Posts. Movement speed reduced by 5m/s. C-Tier: Paralysis can paralyze 1 limb for 3 Posts. Movement speed reduced by 5m/s. B-Tier: Paralysis can paralyze 2 limbs for 3 Posts. Movement speed reduced by 10m/s. A-Tier: Paralysis can paralyze the whole body for 4 Posts. Movement speed reduced to 0m/s. Ω-Tier: Paralysis can paralyze the whole body for 5 Posts. Movement speed reduced to 0m/s. Immobilization based abilities are caused by rooting a person in place, whether this be by pinning them, driving a blade through their foot, using nets, or using magic to create a binding of some type. Immobilization will eliminate any movement from the place they are “stuck.” Immobilization can be broken with abilities of the same tier at any time. D-Tier: Immobilize 1 limb for 2 posts. C-Tier: Immobilize 2 limbs for 3 posts. B-Tier: Immobilize 3 limbs for 3 posts. A-Tier: Complete immobilization for 4 posts. Ω-Tier: Complete immobilization for 5 posts. Freezing effects can only be produced through ice spells and act by freezing a limb for a set amount of time. D-Tier: Ice can freeze 1 limb for 2 Posts. C-Tier: Ice can freeze 2 limbs for 3 Posts. B-Tier: Ice can freeze 3 limbs for 4 Posts. A-Tier: Ice can freeze whole body for 5 Posts. Ω-Tier: Ice can freeze whole body for 6 Posts. Typically, poisons kill people over time, but at lower tiers, it has weaker effects. Poison will double reaction times and reduce ability speeds by half. These abilities can be used by those with Stealth or Poison Mages. Poisons may also be purchased from players or the shop. D-Tier: Deals stinging pains throughout body for 2 posts, reducing ability speed by half and doubling reaction times. C-Tier: Makes muscles sore, stinging pains, minor headaches for 3 posts, reducing ability speed by half and doubling reaction times. B-Tier: Coughing up of blood, sore muscles, stinging pains for 4 posts, reducing ability speed by half and doubling reaction times. A-Tier: Skin turns black, eyes bleed, blood coughing, sore muscles, stinging pains. At this stage, poison abilities may be used to kill a person. Lasts for 5 posts, reducing ability speed by half and doubling reaction times. Ω-Tier: Death/Loss of Consciousness in 3 posts, simultaneously reducing ability speed by half and doubling reaction times. Stat buffs are abilities which can increase a person's basic statistics including strength and speed. Stat buffs can only be used by Strength-Users through Magoi Manipulation, Body Manipulators, Metal Vessel Users through Djinn Equip, or Household Members through their Household Vessels. Stat buffs require a constant upkeep cost along with the initial cost. The upkeep cost is paid for each proceeding post after the initial until the buff is null. Eg. A B-Tier buff costs 30 Magoi/Stamina on the initial post and 15 more for every post it is used thereafter. Stat buffs are considered supplementary abilities, and cannot do anything besides provide one of the two possible buffs (either strength OR speed, not both). Strength buffs allow people to deal passive damage with their bodies, just like beasts! There is no strength buff for Ω-Tier. D-Tier Can deal D-Tier damage through physical attacks. C-Tier: Can deal C-Tier damage through physical attacks. B-Tier: Can deal B-Tier damage through physical attacks. A-Tier: Can deal A-Tier damage through physical attacks. Speed buffs allow people to move at extreme speeds which would typically be impossible. Speed buffs affect only one method of movement (General, Swimming, Burrow) per ability. If burrowing, you may stay underground for as long as you can hold your breath (2 posts for human, 4 posts for Imuchakk) before passing out and dying. The following magic types and abilities are forbidden from being used. If you attempt to register one it will simply be denied. Some of these would probably only come up for Djinn, so really a lot are simply signs that Djinn with these abilities will not be released. Staff created NPCs for plot purposes may have some of these abilities. Speed determines how fast the ability is created and moves at. This must be included for every ability. The scale is the size of the ability itself, with any side of the ability being no larger than the meters provided. For spheres, this is the maximum diameter of the ability. Scale does not extend the range of an ability. This determines how far an ability travels, or how much space it can move around within. For Strength abilities, this would only be used in special circumstances, such as throwing your weapon. For Manipulation, this would only be used for projectile-based attacks. This determines the "Number" of portions or pieces within your ability. This includes how many slashes, hits or other portions of the ability. The "Amount" of an ability may produce more possible hits, but it also splits up the damage or effect. Eg. A C-Tier Ability may produce 2 rapid slashes. C-Tier damage will be applied but ONLY if both hit. If only 1 makes contact, D-Tier damage will be applied. Stat buffs can only be used by Strength-Users through Magoi Manipulation, Body Manipulation specializations, Metal Vessel Users through Djinn Equip, or Household Members through their Household Vessels. Stat buffs require a constant upkeep cost along with the initial cost, like all sustained abilities. 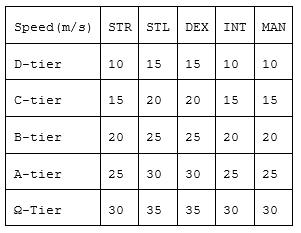 Stat buffs are considered supplementary abilities, and cannot do anything besides provide one of the two possible buffs (either strength OR speed, not both). Speed buffs allow people to move at extreme speeds which would typically be impossible. Dominance is unique, in that their beasts abilities will be based off the type of beast.